Recent evictions across the country have once again called into question the practice of forced removals and the issue of access to adequate housing in South Africa. 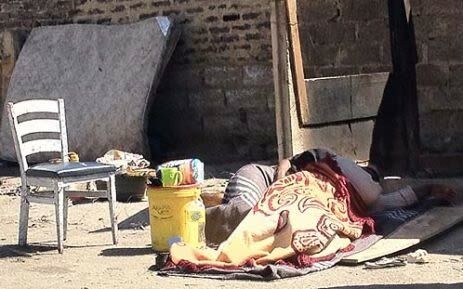 Stuart Wilson, Executive Director of the Socio-Economic Rights Institute of South Africa (SERI), says that we need to change our perspective when considering illegal squatters across the country. It’s no good to berate people as land invaders. That’s not the way to frame the issue. The way to frame issue is this massive need for land that simply isn't being met, despite the best efforts of many organs of state. Although the government has invested in subsidised housing programmes, many South Africans can't afford adequate housing and face the on-going risk of eviction by occupying backyard dwellings, informal settlements and "slum buildings". In the inner city of Joburg alone, about half of the people living there can’t afford market-related rent. Marlboro forced removals. Image courtesy of Eyewitness News. The forced removals in one place means unlawful occupation somewhere else, unless the state provides accommodation. Temporary settlements tend to turn into permanent housing for lack of a sustainable plan by the state to keep them temporary. The Informal Settlement Network's (ISN) Sipho Vanga says that the latest Marlboro Gardens evictees are scattered all over. He says some are sleeping outside while others have occupied warehouses. Vanga says that ISN is trying to identify land in the municipality and is attempting to get a tented temporary accommodation for the vulnerable evictees. In 2012 Marlboro residents were also forcibly removed and some are still without accommodation, despite a ruling by the Constitutional Court for the Department of Human Settlement to offer alternative housing. Until today, some of them are still squatting in old buildings and we are afraid as ISN that they will be evicted again. Joseph in Diepsloot told CapeTalk/702's Africa Melane that he was forcibly removed in 2007 in Dainfern and has been living in temporary accommodation since. Lwandle evictee Nomapheli Pupu says that new occupiers are making living conditions difficult in the relocation area, Siyanyazela. Watch the EWN video covering the current living conditions of evictees in Blikkiesdorp, which was intended as temporary settlement for those evicted from various township dwellings in Cape Town since 2007. Lwandle forced removals. Image courtesy of Eyewitness News. Last week, in Marlboro, Gauteng, a group of people who had been previously evicted from a low cost housing project they had occupied illegally in Alexandra were to be forcibly removed from their current place of occupation at the local stadium. According to the city of Joburg they had been served eviction notices almost three weeks ago and they had no other choice to remove the group because the stadium is not an ideal place for people to live. Watch the EWN video covering the latest Marlboro evictions. 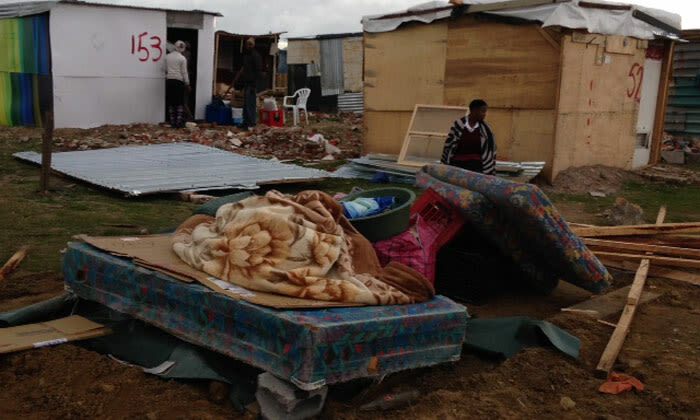 Hundreds of shack dwellers from Lwandle, in Strand just outside of Cape Town, were evicted last year. The construction of alternative accommodation for those evicted has now ceased, and left dozens of evictees homeless according to reports by GroundUp. Watch the EWN video covering the Lwandle forced removals. According to Wilson, the Constitutional Court has previously ruled that evictions that lead to homelessness are generally unlawful, yet evictions still take place without alternative accommodation or long term solutions in place. Poor people are often unable to challenge court orders because they do not have access to legal representation.